FANBOY PLANET.com . : mc-bookoflies :. Every now and then, a writer comes along with an idea that turns things upside down. But as better writers than I have noted, it's better when you can merge that with another idea that really throws things into a wild - and compelling - story. So Brad Meltzer offers the following idea - the Bible never actually mentions what murder weapon Cain used to kill Abel. He just rose up and - bam! History's first murder - we can argue the theology some other time. What if that weapon were something truly unique? You'd think what it was would have been very important, and very much sought after. Interesting enough, but Meltzer notes something about American mythology. Young Jerry Siegel co-created Superman after the mysterious shooting death of his father. On the surface, these two footnotes are unrelated, but therein bubbles the premise of The Book of Lies. In some ways, the style bears resemblance to Dan Brown's The Da Vinci Code. Both novels move at a breakneck clip, in short, almost staccato chapters. But Meltzer knows when to slow things down a bit, and though he put together an intricate puzzle of a plot, he also has more on his mind than just telling a story. His protagonist, Calvin Harper, stands in for all those who couldn't care less about the origins of Superman's creation. After a prologue set nineteen years earlier that would be right at home in a Stephen King novel, the action focuses on the adult Cal trying to run from his childhood trauma. No, that trauma hasn't come in the form of a lurching ghost; those that haunt him act strictly on his subconscious, yet it's obvious that what happened to him informs his every choice. When the past does appear before him, it's difficult and painful enough. Unfortunately, there's also an insane killer acting on behalf of a global conspiracy that gets in the way of Cal confronting his demons. 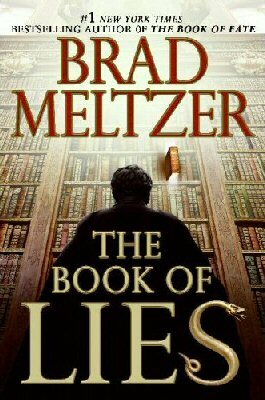 With The Book of Lies, I'll admit that Meltzer has combined some of my favorite subjects - Biblical scholarship, comic book history and more that would ruin the surprise if I continued, but that doesn't mean you shouldn't take my word for it on the novel's quality. The characterization is sharp, something comics fans know from Meltzer's DC work. Even though this novel goes by at lightning pace, Cal fleshes out nicely, as do several other characters. A few seem two-dimensional, especially the killer Ellis, but then again, Ellis and his dog are just so effectively villainous that you don't need to know much more. Sometimes evil is evil. To keep his suspense going, Meltzer also understands that sometimes, less is more. That carries through right up to the ending, which may leave readers debating a bit. But that elevates this book from being just pulp - it's a good story with room for reflection. Along the way, there's also plenty of education. In his afterword, Meltzer explains exactly where he veered off from historical fact, and it's also clear he did some meticulous research before taking off on a flight of imagination. He also mentions the influence of some of his peers in the comics world - specifically Geoff Johns and Grant Morrison for getting him interested in the story of Cain. Morrison has also long touted the value of superheroes as our American mythology - and he means that in the best sense of the word, not as a dismissive concept. Meltzer ties the two together, and that, too, should provoke some thought. The Book of Lies isn't going to change how people feel about the Bible, nor should it. But it just might spark a few new ideas about our culture's relation to it. As for me, I think I really have to make a pilgrimage to Cleveland. By the way, you really do need to go here -- it both ties in to the novel and Brad's life, and could yours, too. Make a difference.